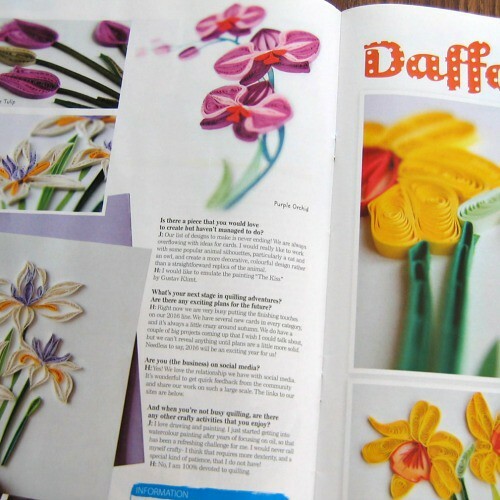 Last summer I was contacted by the editor of a new UK craft magazine who asked if she might publish photos of my quilling in an upcoming issue and would I also answer interview questions. I agreed, sent over what was needed and believe it or not, completely forgot about it.... in my defense, the wedding happened about the same time. While cleaning out my inbox a couple of weeks ago, I came across our string of messages and emailed to ask if the magazine had made it to print. Yes... last autumn! Soon after, a copy arrived in my mailbox and I snapped these photos to share with you. What a nice magazine! 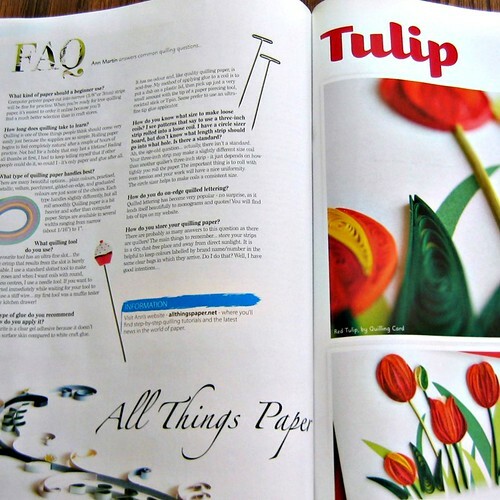 As it turns out, the entire issue is about quilling. 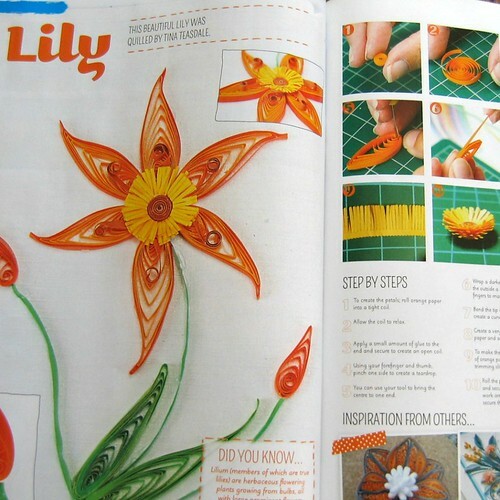 There is information on supplies, coil and scroll instructions, and a number of step-by-step tutorials for a variety of flowers including lilies, tulips, and daffodils... just in time for Easter card making. Even the paper it is printed on is high quality, always a plus in my book. In addition to my interview, there is one with the owner and designer at QuillingCard, Huong Wolf and Jenna Faden, and another with Erin Curet (Little Circles). 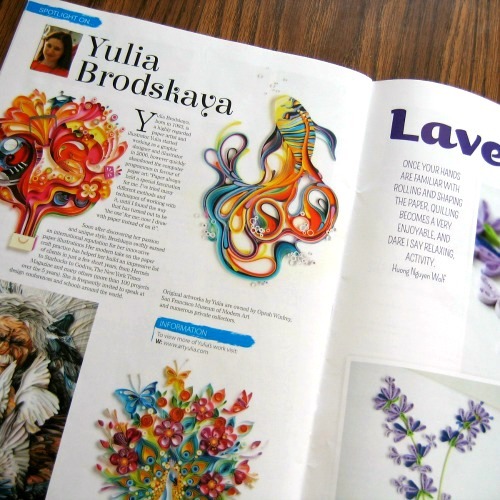 Natasha Molotkova (PaperGraphic) and Yulia Brodskaya (ArtYulia) are spotlighted too. ...and projects to get you started. Quilling Card supplied many professionally quilled floral examples and capsule images were gathered from a number of quilling blogs. The tutorial designs are not too intimidating for beginners. One more neat thing about Get Creative with is that a specific crafting topic is covered extensively each month. The newest issue focuses on creating backgrounds. Get Creative with is published by the same team as the popular UK magazine, Making Cards (which I have seen for sale at bookstores here in the U.S.) and is on Facebook, Twitter and Pinterest. Lovely! And the more recent issues look interesting, too. 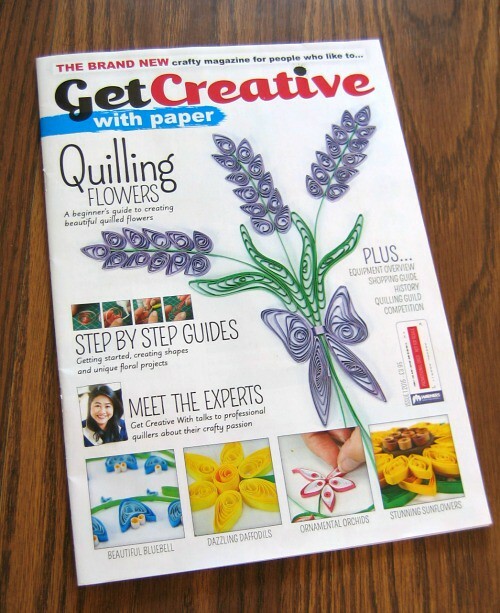 Thanks Cecelia and yes, it's so nice to see quilling gaining attention. Hi Fiona, I think they're onto a brilliant idea to feature a topic in-depth each month. What a great way to share the very latest. 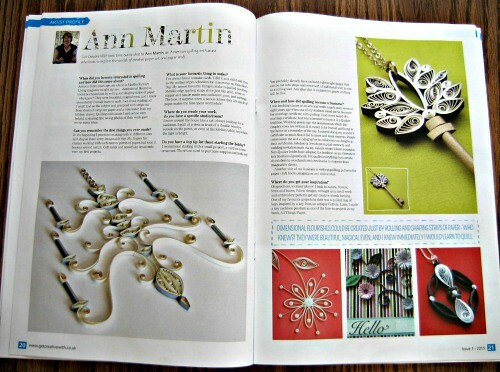 Congrats, Ann and what a great magazine. Yes, it was LCC that gave samples of those strips. Thanks Gail! Good to know. WOW - Congrats! What a nice surprise for you! Looks like a great writeup. That's a mag worth keeping. Congratulations, Ann - well deserved! Congratulations, Ann! You continue to be my inspiration and digital mentor! I'm downloading this today! Wow ...congratulations on the awesome recognition. Thanks for your enthusiasm, Kathy Ann!